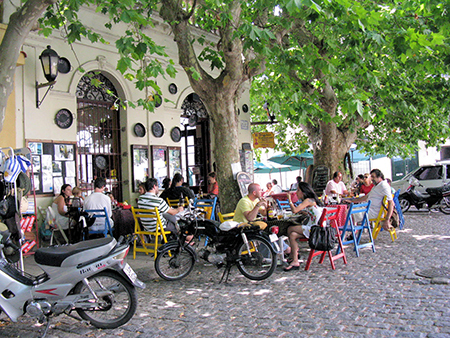 Colonia is the most attractive and convenient town in Uruguay. It’s busy all year with a thriving local population as well as travelers from Uruguay’s other cities, Buenos Aires, and around the world. It offers a solid, long-term property and rental market. Colonia has everything you’ll need for a comfortable and enjoyable lifestyle. From fine dining to cheerful sidewalk cafés to all the practical shops and services you’d want to make life convenient. I’ve always enjoyed walking along the banks of Colonia’s expansive, lazy river, poking around the marina or enjoying the evening sunset. I’ve also spent many an afternoon exploring the cobblestoned streets and alleys in the historic center, while enjoying its elegant restaurants, upscale shops, and 17th-century architecture. It’s all walkable and less than 30 miles from Buenos Aires by ferry. The Portuguese actually settled Colonia in the 1600s (rather than the Spanish), and their original settlement has been meticulously preserved. Colonia’s historic center, unsurprisingly, is a UNESCO World Heritage Site… drawing people from far and wide to see its colonial homes, enjoy the popular restaurants, and browse the exclusive shops. Colonia has four seasons, and the weather is mild with moderate rainfall. The hottest month is January, with an average high of 81°F (27°C). The coldest month is June, with an average high of 53°F (11.5°C). Simply put, this town of around 26,000 is a quality, branded destination. Colonia is beautiful and well-known with an excellent service sector for both visitors and residents. Year after year, properties here are in demand. Colonia’s property market has posted healthy gains since I first came here in 2004. In some areas, gains have exceeded those in the far more famous Punta del Este. Like the rest of Uruguay, Colonia held strong through the 2008 recession, posting solid gains while North America and Europe watched their markets (and economies) crumble. Single homes, rather than condos or apartments, have traditionally dominated the real estate market here. Today, however, the condo buyer will find an ever-increasing number of options. There are three areas of Colonia that hold my interest: Barrio Histórico, Centro, and the Zona Balnearia (beach zone). Let’s take a look at each one. 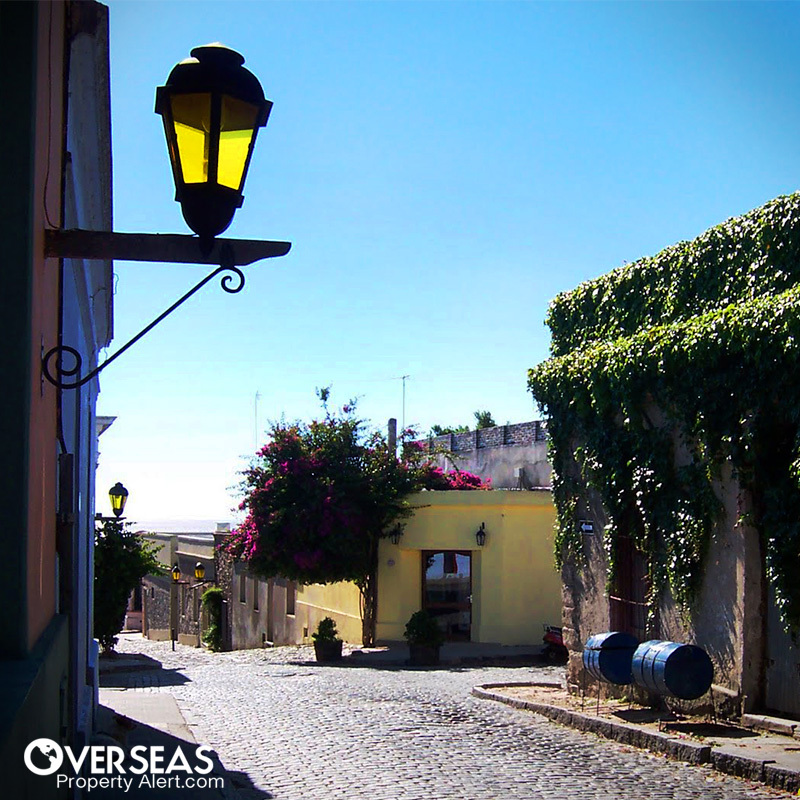 Barrio Histórico is the original colonial settlement, built almost entirely of stone. If you’d like to buy or restore a historic building—or manage a rental—this is the best place to do it. It has a high concentration of fine restaurants and upscale shops as well as a continuous supply of international visitors coming to enjoy them. 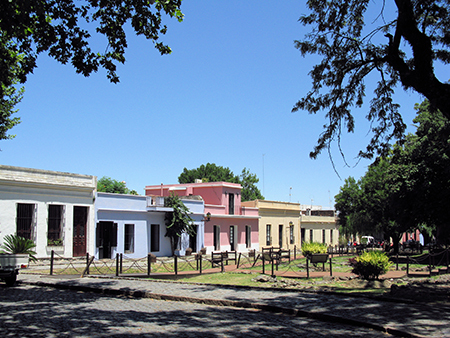 Unlike the resort at Punta del Este, Colonia is open all year. Even on chilly winter days, I’ve seen the streets bustling with visitors and locals alike. Barrio Histórico boasts a good number of homes from the late 1600s, still standing and still occupied. It’s hard to find Colonial-era homes with river views. This one not only has a river view, but it’s located on a historic cobblestone pedestrian walkway. Built in 1827, this two-bedroom house has 153 square meters (1,646 square feet) of living space built around an interior courtyard. There is also a rooftop terrace and attached garage. The original colonial characteristics and materials, such as stone walls, have been maintained. The asking price is US$300,000. A small colonial home on an attractive palm-lined street in the center of Barrio Histórico is also on the market. With 120 square meters (1,291 square feet) of living area, it includes two bedrooms, original stone walls, a spacious kitchen, and the option of installing a rooftop terrace on the reinforced concrete roof. This location is also very convenient, it’s close to the Puerto de Yates (marina) and Avenida General Flores, which is the main drag. The asking price is US$320,000. Both of these homes are in prime rental territory. They’re also part of the architecturally protected World Heritage Site, so you’ll need to preserve the original look of the home during any modifications. Centro lies just outside of Barrio Histórico and has its own share of antique buildings. This reasonably priced sector is known for quiet, tree-lined streets, casual restaurants, and parks. It also has a bustling shopping district where you can get everything you need to run the household. Centro offers easy access to the historic center’s restaurants, galleries and attractions, yet its side streets are relatively free of tourist foot traffic. I believe Centro offers the best real estate and lifestyle values. A well-located rental will do well in Centro… although, rentals in Barrio Histórico will go first. Located one block from the river, two blocks from Barrio Histórico, and three blocks from the port terminal for ships and buses, I found a house for sale in a quiet, residential, sycamore-lined street. It has two bedrooms, two bathrooms, and even a small, interior courtyard. Built in the 1920s, it was recently remodeled and is in move-in condition. The asking price is US$220,000. Conveniently situated on Avenida General Flores, which bisects Colonia’s historic district, I found an apartment listed with three bedrooms, two baths, and 94 square meters (1,011 square feet) of living space. Built in 1983, it has been completely remodeled with new kitchen and baths as well as flooring. The asking price is US$300,000. This property is in Centro, but it’s just a block outside of Barrio Histórico. The Zona Balnearia runs along the ocean-like Rio de la Plata heading north of town. 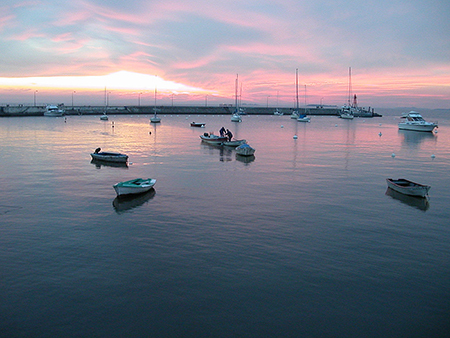 It’s a residential area with quiet neighborhoods and stunning water views… especially at sunset. If you’re looking for a single home with a larger yard that’s near the water, the Balnearia is a good bet. Today there are also a number of good-looking condo projects springing up on the Balnearia whose prices are approaching Punta del Este levels. And they’re selling like Punta del Este, too, as wealthy clients from nearby Buenos Aires (only an hour away by ferry) grab up the pre-construction offers as soon as they hit the market. A condo right on the waterfront road (called the rambla) has three bedrooms—two of which are suites—three bathrooms and a living area. From the balcony you get a nice river view. The brick building is small with only three floors, and the two-story apartment has 102 square meters (1,097 square feet) of living area, along with covered parking. The asking price is US$250,000. Rodolfo Fernández of Toribio Achával. Cell +598 9952-5679; email:RodolfoFernandez@toribioachaval.com; www.toribioachaval.com.uy. Joaquín Mato of Sergio Mato Inmobiliaria. Cell +598 9952-2672; email:joaquin@sergiomato.com; www.sergiomato.com. You can hardly go wrong buying a fairly priced property in Barrio Histórico… you’re buying a piece of history that will hold its value. Centro is offering the best lifestyle for the money… right next to the historic center but without the tourist foot traffic. Prices here have appreciated, but there are still good values in this market, with room to grow. After all, Colonia is one of the world’s treasures and less subject to market whims. Best of all, Colonia is a great place to live. In the end, that will be its most important attribute. Regarding wills, do you have any thoughts on a will written in the United States for a person who lives in Belize and owns land in Panama? Trying to execute a U.S. will in a foreign country is usually a long and arduous process. And many U.S. wills won’t meet the legal requirements in civil law countries such as Panama (and half of the world’s other countries). To be safe, you should have a will in every country where you own property in your own name. In your home-country will, use a statement that says “…my property in Panama shall be dispositioned in accordance with my Panamanian will, on file in Notaría 20 in Panama City.” The small cost of an in-country will can save your heirs lots of hassle and time. If your foreign property is owned by a structure (such as an LLC or a Mexicanfideicomiso) rather than your own name, then it’s best to handle your succession within that structure. That will be easier than using a will and allows you far more flexibility. Follow the link to see my previous article on inheritance laws abroad. If foreign real estate held through a self-directed IRA is your only foreign asset, do you need to declare that on your taxes? To answer this specific question, no; you do not need to report foreign real estate owned by your IRA or 401(k) on your personal tax return. In fact, you don’t report any of your IRA/401(k) holdings (like mutual funds, etc.) on your tax return. Likewise, you do not report anything the IRA-held real estate earnson your return. Even if you own it personally—outside of an IRA, in your own name—you do not need to report the fact that you’ve purchased or own real estate in a foreign country to the IRS. You would, however, need to report any income or capital gains that it earns. If you own real estate that’s held by a foreign structure (such as an LLC or corporation) rather than your own name, you will have to report your ownership stake in that structure. How can you completely ignore U.S. State Department warnings against travel based on drug cartel activity? We have traveled extensively throughout Mexico. Unfortunately, we no longer feel safe doing so. Would you tell the State Department it is lying about drug routes and cartel activity? I fear you are simply trying to sell something, ignoring the risk to people’s safety. If I paid attention to every travel warning issued by the State Department, I’d never go anywhere. My problem is that these warnings are sometimes out of date, too widely generalized, and based on the (sensational) media. So I rely on personal experience and the experience of expats living in the locations I write about… in the case of Mexico, that’s more than a million Americans. In Mazatlán, where I’ve recently purchased a home, my wife and I are joining a community of several hundred Americans and Canadians, and we all feel perfectly safe being here. I should point out that many countries have issued travel warnings about coming to the United States because of our mass shootings and big-city murder rates… yet I don’t see many Americans fleeing the country to escape the crime. All that said, if you don’t feel safe in Mexico (or anywhere else), then don’t go there. It’s important that we be comfortable in our adopted countries. But follow your instinct—gained from your own experience… not government agency publications.